Level 1 is divided into 8 parts which are all linked so they can be used interchangeably. No need to buy eight books. They’re all in here. Almost 800 pages of grooves. Think you’ll find anything useful in here? Roughly 12000 bars of grooves can be found in here. Better have too much than too little, right? 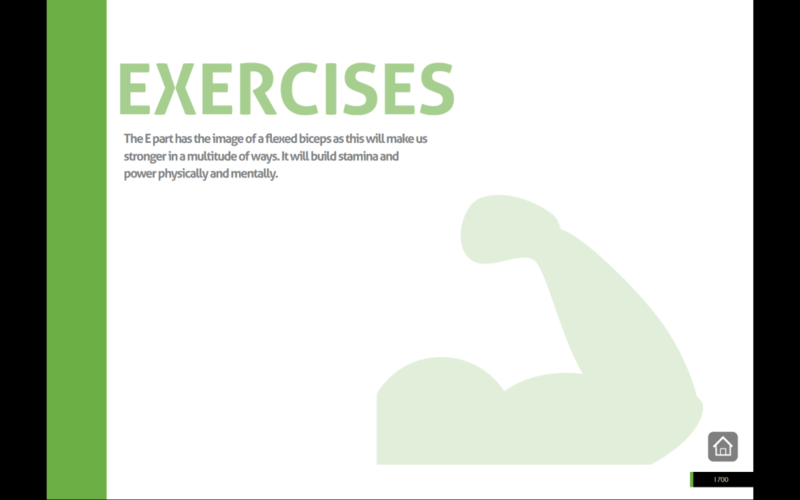 Over 700 pages of fills in Level 1. That’s over 10000 bars of fills. Surely you’ll learn something, don’t you think? 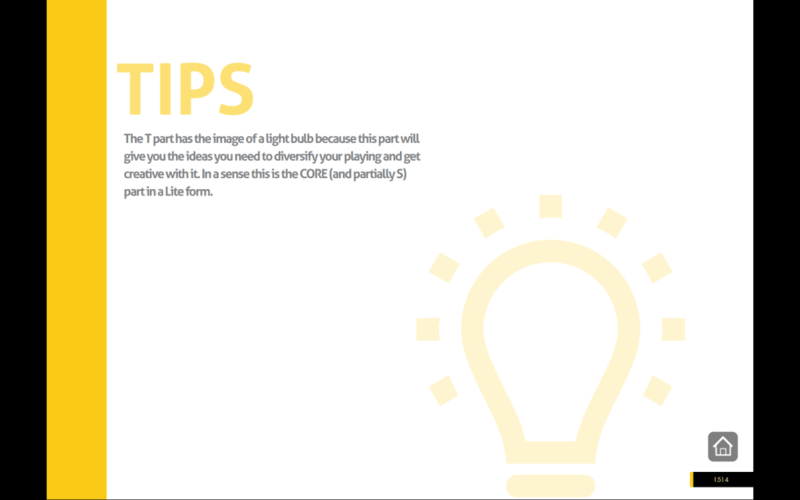 These tips will show you what can be done with a little creativity. After practicing this a number of times it will become a part of your playing. From this point forward you will no longer be searching for more inspiration. Instead you’ll be searching for more time to explore. You will be prepared. Sub 5 will prepare you. If you can take it, Exercises will show you exactly what needs to be done to get over the hurdle in order to reach your next goal. It’s there. You just need to use it. All twenty four Categories Of Rhythmic Elements can be used in quintuplet playing as well as any other subdivision. So while you’re studying quintuplets you’ll be vastly improving your theoretic Skillz at the same time. 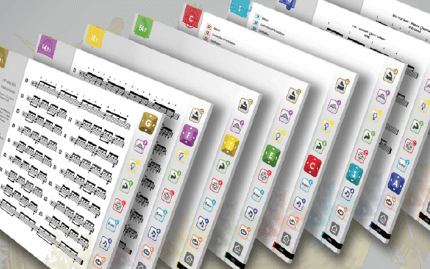 Twenty four System and Formulas categories specifically written for quintuplet playing. This will not only get you playing. It will also get you thinking, feeling, imagining, constructing and improvising in quintuplets. Click a link in the Audio part of Level 1 and your browser wil open the corresponding page in YouTube. You’ll have a choice of songs to play along to while practicing specific grooves and/or fills. 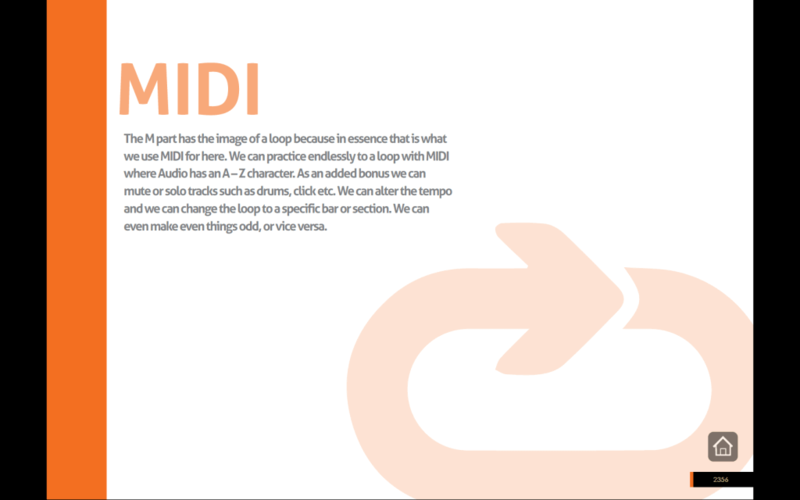 Click on a link in the MIDI part and the corresponding MIDI loop will open on our website. You get to decide what tempo, which instruments, and which mix you want to play along to. 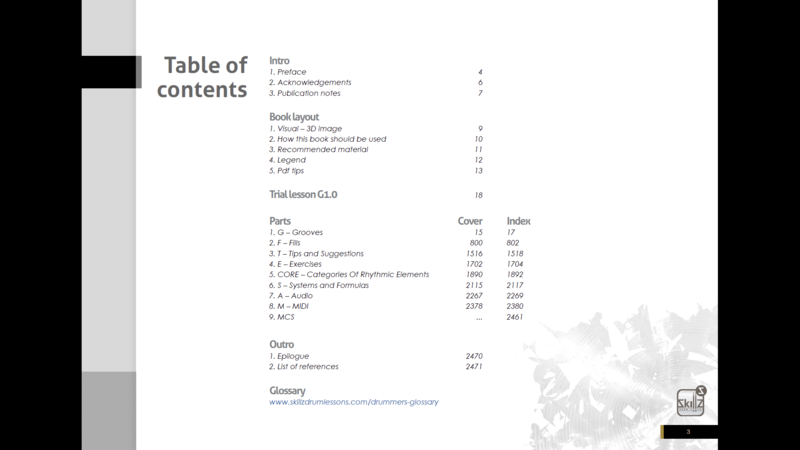 Here’s why PDF is our favorite format. In fact it’s why we write books. We can put an enormous amount of info into one document without it becoming impossible to navigate. In fact, navigating has never been easier and more convenient because of this format and our structure. Granted, knowing where to find everything will take time. But you’ll save a LOT more not having to flip through pages. You have too little time. We get it. Good news, you can take our books everywhere you go. Laptop, tablet, even a phone will do. This way you never leave the house without your drum lessons. Get studying done anywhere, whenever you have time. Not knowing what to study next is simply a waste of time. But it has to be structuted if you don’t want to waste time. That’s exactly why we write books. Perspective is relative. So if you know where you are and where you want to go, you have an idea of what still needs to be done in order to get there. Our books will give you this perspective. More importantly, they do so while offering infinite possibilities. 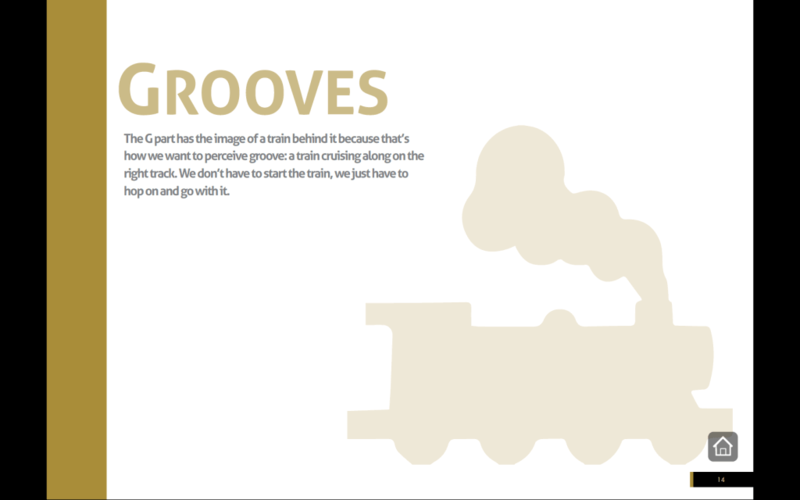 Our books are NOT about teaching you the lick of the week, or the “my favorite groove” nonsense. They stimulate you to think for yourself, come up with your own ideas and as such prepare you for improvisation and a world of creative freedom. 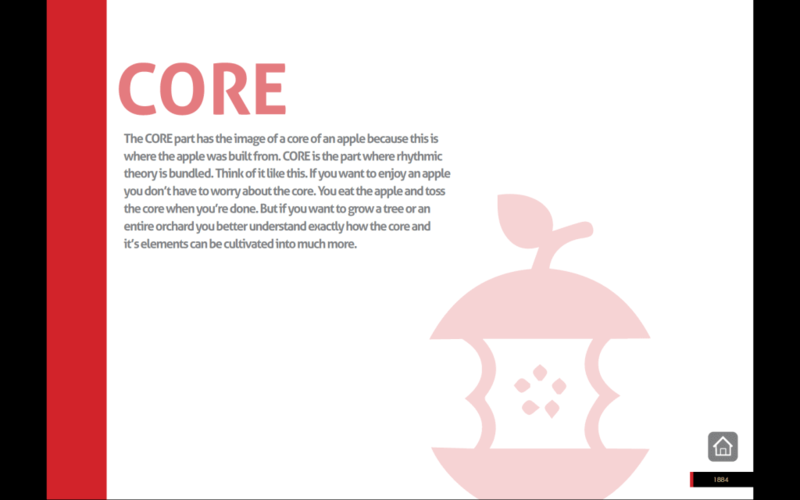 The traditional index tells you where something is and then you flip through pages to find the desired page. PDF makes it possible to link to a specific page so you no longer have to scroll. Then shouldn’t an index become more than 1-dimensional? That’s why we came up with the matrix shaped index to make it 2-dimensional. 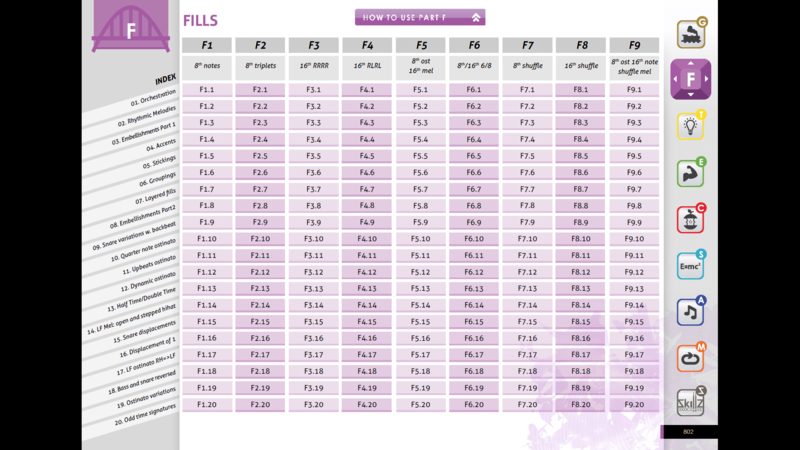 Horizontally we have the chapters based on subdivisions (timefeels). Vertically we have the paragraphs based on different subjects. And everything is interactive so no more scrolling, just clicking. This will save you lots of time. And perhaps even more importantly, it will give you much more perspective of where you are and precisely what needs to be done in orde to get to your next level. In fact you can go front to back switching between different parts. So this makes it 3-dimensional but who’s counting, right? 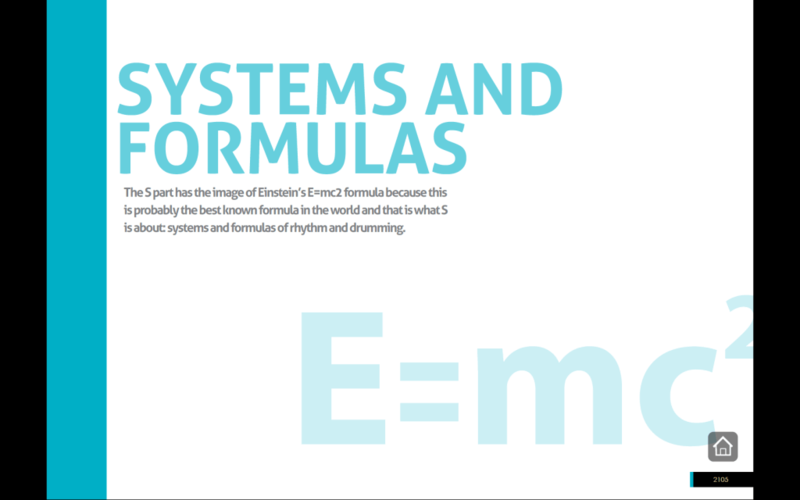 You don’t want to play the drums to be studying rhythmic theory and memorizing all sorts of systems and formulas. But the further this rthythmic journey takes you, the more convenience it brings to have a clear picture of this. That’s why we came up with Parts C(ORE) and S. The CORE, short for Categories Of Rhythmic Elements and its corresponding Part S, short for Systems and Formulas, will have you gaining perspective before you know it. 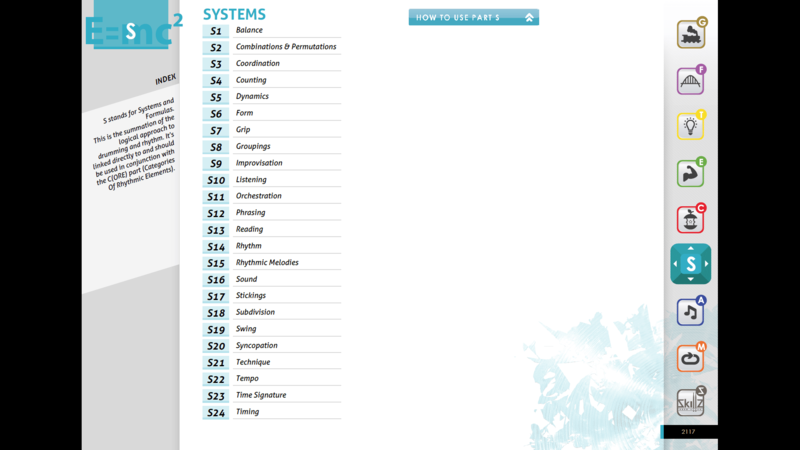 By dividing them into 24 categories we can very systematically address any weak spots in our playing. In order to fix the problem, you first need to identify the problem. Level 1 wil do just that. If you’re a beginner we recommend you don’t study out of Parts C&S too much too soon. Concentrate on Groove and Music first. Parts G(rooves), F(ills), T(ips) and E(xercises) are actually a Lite Version of parts C and S. So you will actually be studying your theory without consciously knowing it. These are some specifical Frequently Asked Questions about Level 1. If you have a question about something else please refer to our main FAQ section where all are bundled. 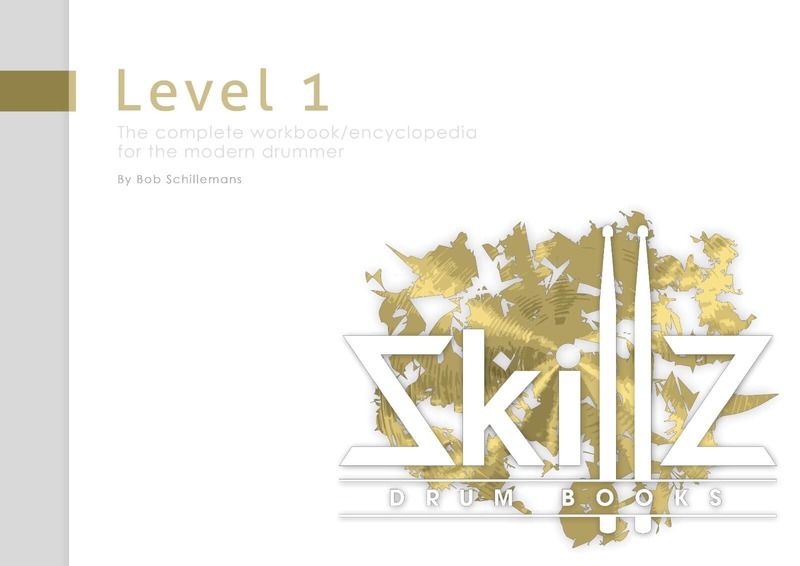 Level 1 is an encyclopedia of drum lessons, rhythmic theory and systems to implement this. 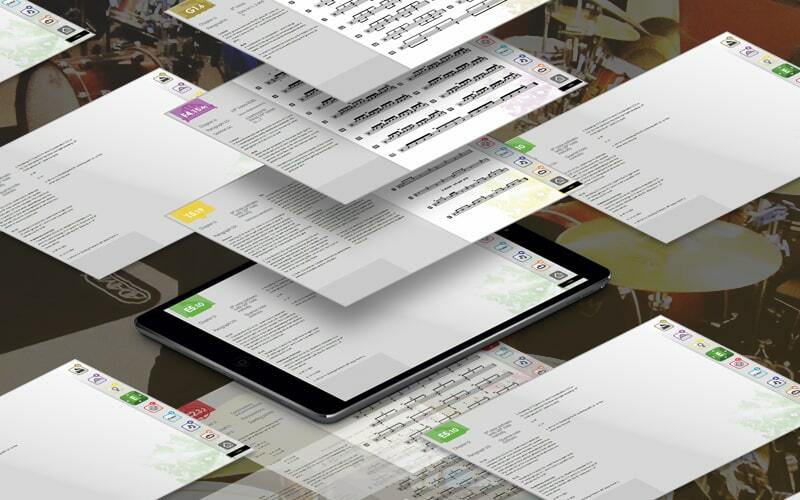 Level 1 provides the user with a bird’s eye view only very advanced students of rhythm would normally have. How should I study from Level 1? Basically you start at G1.1 and work your way down in a diagonal motion towards G9.20. There is no one way, only your way. However, we encourage you to view Level 1 as a 3D method as much as possible. Should I play every exercise in Level 1? No you shouldn’t. But you may. You decide the pace with which you move forward. Just remember that if you can’t play something well there’s a very good chance this is precisely what’s keeping you from progressing more. Should I start using parts C and S right away? No. These will come into play naturally more and more. 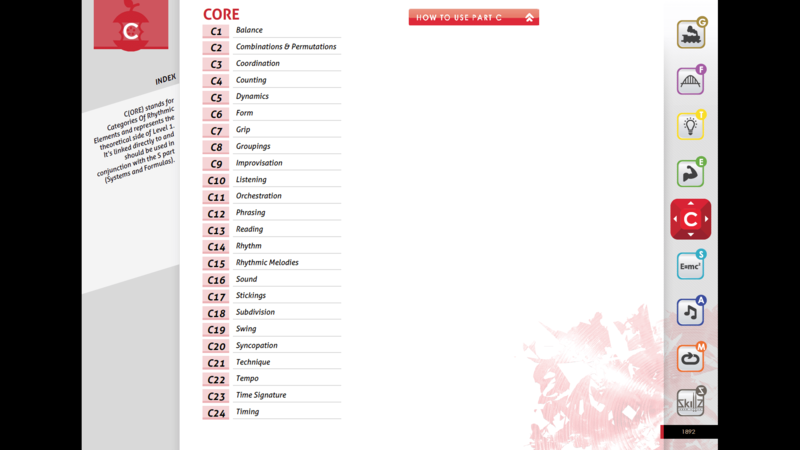 Parts C and S are a heavily compressed version of parts G, F, T and E. So the more advanced students get, the more they will feel inclined to study from parts C and S.
Why are there so many holes in the index of part A? That’s because we haven’t been able to scan and find an appropriate song for every groove or fill in the book. Yet. All of our books will be updated so they will get better all the time. 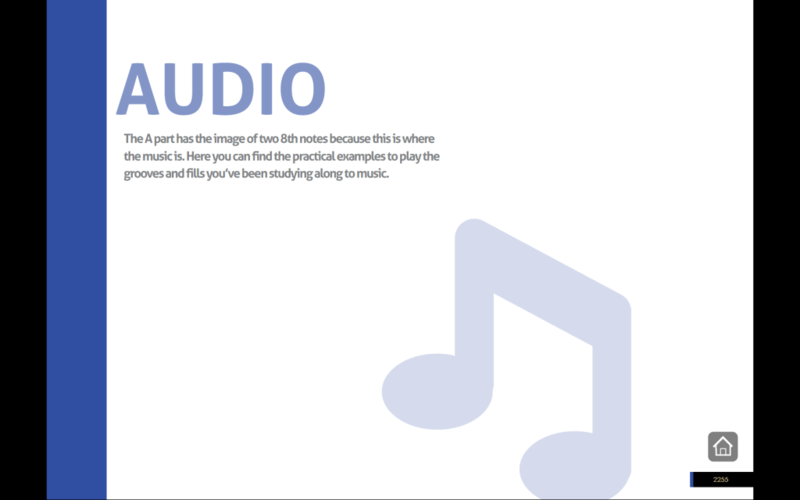 We won’t rest till we can assign a specific audio track to every groove and every fill in Level 1. No, you’ll learn this as you go. Theory is not our main focus. It should never be. First there was music, then there was music notation. Not the other way around. First breathe in and out deeply a few times. Feel better? Good. 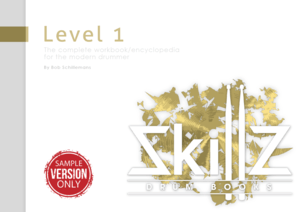 Level 1 is meant as an encyclopedia of drumming and rhythm exercises. Who’s to say what’s the correct order, or how long it should take you to absorb all the knowledge inside? You decide. If you need help, you can send us a message or visit a local teacher. Should I play everything chronologically? Absolutely not. There is an order because there had to be one. We hop around Level 1 with students all the time. It’s about studying that which makes the most sense at this point. Absolutely! You can download Level 1 Trial Version and start to use it right away. You only need to enter a valid email address which we will only use to notify you of any future Skillz news and/or updates. If you like the Trial Version you can purchase the whole package once you feel like it. Why are there even more holes in the index of part M? That’s because we haven’t had the time to develop specific MIDI tracks for every groove, fill, and CORE element. Yet. All of our books will be updated so they will get better all the time. 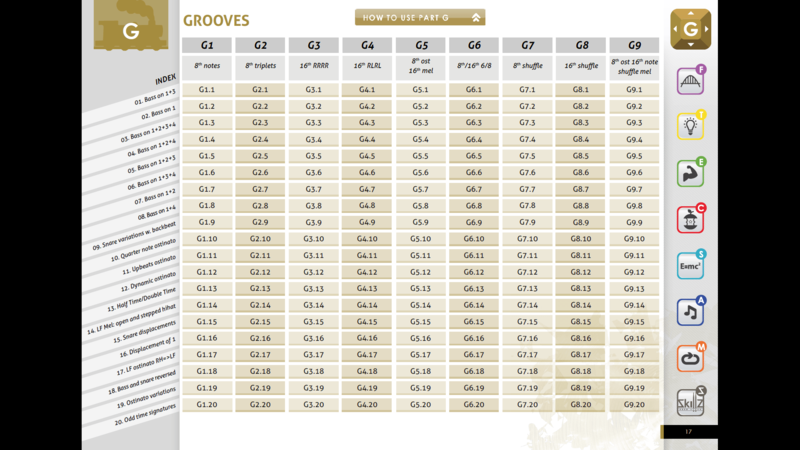 We won’t rest till we can assign a specific audio track to every groove and every fill in Level 1.